Understated or over the top, your Christmas tree is the ultimate expression of your festive style. Worried about feeling underwhelmed by your tree this year? 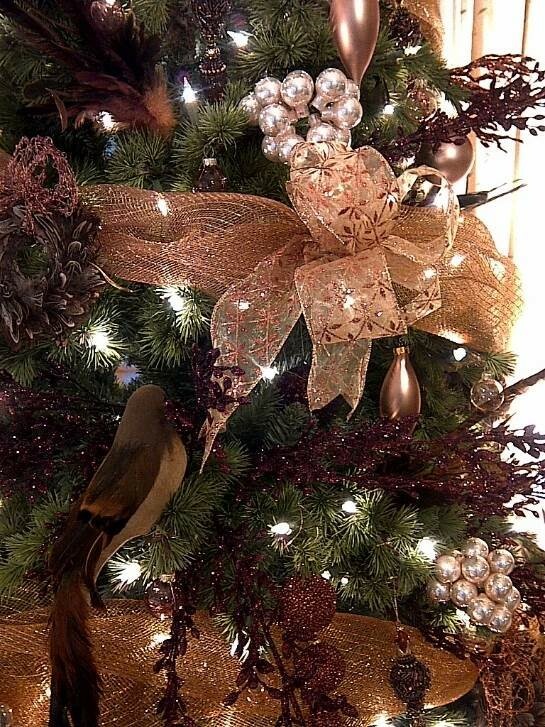 For a more stylish, striking tree, glean tips from the Christmas Decorating pros at Kate’s Garden. Click here for more information on our Christmas Decorating Service and Portfolio. Remember that the “early birds” get the best trees. Keep your trees outside until you are ready to decorate. Untie or unwrap it two days before you decorate so that the branches can fall. Scotch Pine is the most common tree because the needles barely fall off even when dry. Douglas Fir has widely spaced branches which are great for larger ornaments. Spruce has an unpleasant odour when the needles are crushed. If the needles don’t spring back when you rub them, choose another tree. Trees look shorter and smaller on a lot or tree farm than they will in your home. Measure the height and width of your room before you go tree shopping. Do not forget to add extra inches for the tree stand and tree topper. The top of the tree topper should be two feet below the ceiling. A fresh trunk cut is required when you bring the tree indoors to keep the tree hydrated. When you get your tree home, immediately make a fresh cut across the base of the trunk about a quarter of an inch up from the original cut. Place the tree in a stand that holds at least a gallon of water. To prevent trees from drying, place them far from radiators, fireplaces, furnace ducts, televisions and direct sunlight. Keep your tree fresh by watering it daily. Add a bit of ginger ale to the water. The sugar in the soda helps the tree’s needles stay soft and supple. Allow room above the tree topper to the ceiling for a balanced look in the room. 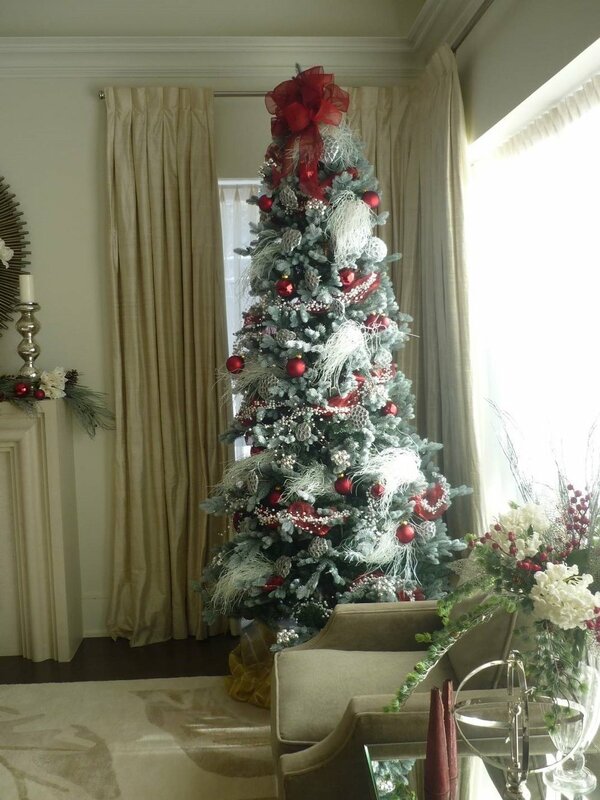 Allow two feet of empty space around three sides of the tree for a well-proportioned look. Remember that if you are decorating the tree for a 360-degree view, perhaps in a window, you need substantially more decorations. · Even if you have a disparate collection of ornaments, you can make your tree look more harmonious by choosing a predominant colour theme and a specific style. The “collected treasures” look works a whole lot better if you add some harmonizing elements. For 2018, the Rustic Woodland style continues to rule though Vintage Glam is giving it a run for the money. Both are nostalgic themes and nostalgic in nature. Rustic Charm features classic motifs; lots of “cabin, birch, deer and canoe” elements in rich cranberry or lipstick red, green and white. Vintage Glam features plenty of sparkling silver and brilliant gold ornaments with sprays of icy glitter. This look is compelling on flocked trees. Whatever colour scheme you use, be sure to pick a colour scheme that suits the existing décor of your room. Want a more dramatic tree? Use one strand of 100 lights for every vertical foot. For extra “pow”, use 200 lights. Never ever use less than 50 lights per foot. Most faux trees are underlit so do not hesitate to add a few extra strands of lights. To light the tree for easier removal, imagine visually dividing the tree into four pie slices. Zig zag the lights in each pie slice working from top to bottom. To help mismatched ornaments harmonize, you can integrate the look of your tree by choosing a wide ribbon or garland as step one. Wind it through the tree from top to bottom. It usually takes five 10-foot rolls of wired ribbon or mesh to decorate a tree effectively. Leave the equivalent of two branches between each swath of garland to allow enough room for your ornament collection. You need, at a minimum, 15 ornaments per foot of tree. Vary the sizes but be sure to keep them colour-coordinated. Use a minimum of 36 ornaments to set the base colour. Make certain they are identical in colour even if they vary in shape. Along with a coordinating garland or ribbon, this provides the visual harmony needed. Even if the rest of your ornaments are mismatched, the tree will look better. Be sure to vary the size and scale and shape of the ornaments as you apply them. Using different ornament shapes and various sizes makes it more visually interesting: round balls, teardrops, icicle shapes, diamonds etc. Transparent orbs help catch and reflect light the most effectively. A few oversized ornaments are must haves best deep within the branches of the tree. They immediately add lots of colour and they light up the darker pockets of the tree. Using this trick adds visual depth to the finished tree. Start with your largest ornaments and layer them evenly throughout. Then use up the medium size ornaments completing the finish details with the smallest ornaments on the tips of the branches. Cluster smaller ornaments together for even greater impact. Add branches, pine cones, berried sprays, floral picks…you get the idea. Professionally decorated trees usually have extra lights, a garland, sprays and branches as well as a treasure trove of ornaments. Kate demonstrates the trends and techniques for Christmas Tree decorating on the Main Stage Daily. Be sure to visit the Kate’s Garden booth near the Main Entrance for the latest in Christmas Décor.